An easy to grow plant that adapts to almost any situation, it grows quite large and makes an impressive floor plant. 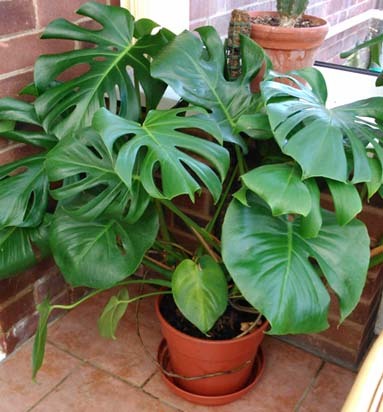 Although this plant tolerates low-light, it needs brighter light for the leaves to split well. It’s perforated foliage is believed to have evolved as protection against hurricane winds. In it’s native home, it climbs high into the trees using it’s aerial roots. It also produces a delicious banana-like fruit, however in the home it rarely does so. Some people choose to cut off the cord-like aerial roots, but it is best to point them into the pot and let them grow into the soil if possible.